Last edited by acus on Sun Oct 28, 2012 1:34 pm, edited 3 times in total. Thanks for the Windows Installer fix. Now some old msi installers don't crash anymore on my system. I am not sure if we can use files from KB2518041 Windows Installer v.4.5.6002.22605 in Windows XP, because they are for Vista SP2. Previous HF KB2388997 are for Windows 2003. Regarding KB2756651 I'll try to post tomorrow a repack for XP. Last edited by acus on Thu Oct 25, 2012 5:06 pm, edited 1 time in total. I tried using the Vistax64 files from KB2518041 in XPx64, but found a few errors in SetupErr.log: "LoadLibrary returned error 127 (7f)". Similar errors may occur in XPx86, but I haven't tested. New may be working ? Last edited by ziomek on Thu Oct 25, 2012 8:19 pm, edited 1 time in total. Same errors in XPx64, but now the display drops to 4-bit color with no way to increase display quality. LoadLibrary returned error 127 (7f). Last edited by 5eraph on Fri Oct 26, 2012 11:35 am, edited 1 time in total. There are similar problems with the latest BlackWingCat's kernel32.dll for Win2k. When it's slipstreamed it breaks something during the components registration phase. The solution is to replace the file AFTER the first boot, i.e. during the setup an older version is used. It may work similarly in this case. Did you observe any problems when the files had been installed in a running system? The 4-bit color problem is due to the latest version of VirtualBox (v4.2.2). Rolled back to v4.2.0 and it went away. The other previously reported errors stand. Last edited by 5eraph on Fri Oct 26, 2012 12:01 pm, edited 1 time in total. You need MSVCRT.DLL / MSVCIRT.DLL from Vista x64 but I don't know whether it will work in XP x64. In UURollup I do use MSVCRT.DLL from Vista 7.0.6002.22755 (x86) but it's only possible with BlackWingCat's kernel where NT 5.2 / Vista only APIs have been added (they aren't present in XP x86, at least some of them should be present in XP x64). I have v7.0.3790.4400 of msvcrt.dll and msvcirt.dll from KB955536-v2. BuildDate is "Fri Oct 31 08:04:47 2008". For future reference, Ver.exe and WinVer.exe report XPx64 as "Version 5.2.3790". Changed the [img] to [url] for you. Screenshot is 808x675. caused problems with directory names and serious corruptiion in many windows ui's including Add Remove Programs on my XP sp3 machine. Can someone please explain what is this and why it may be needed? Thanks. Until new solution, I removed link from 1.st post for KB2756651 msftedit.dll v.5.41.21.2513. It's available link for KB2616879 msftedit.dll v.5.41.21.2512. Thanks for the answer but I still don't understand why would a xp user need those. I have not experienced the problem Shiner mentioned using msftedit.dll v.5.41.21.2513. After seeing tomasz' and Acheron's posts, I took some time to re-test the update with msftedit.dll v.5.41.21.2513 on clean XP VMs using user_hiddens Nov. update pack. In both VMs, the update installed WITHOUT issues afterwards. So, my previous test which resulted in display issues must have been due to something else on that system (despite being resolved by rolling back to msftedit.dll v.5.41.21.2512). Thanks again for time and effort to make and release these updates. 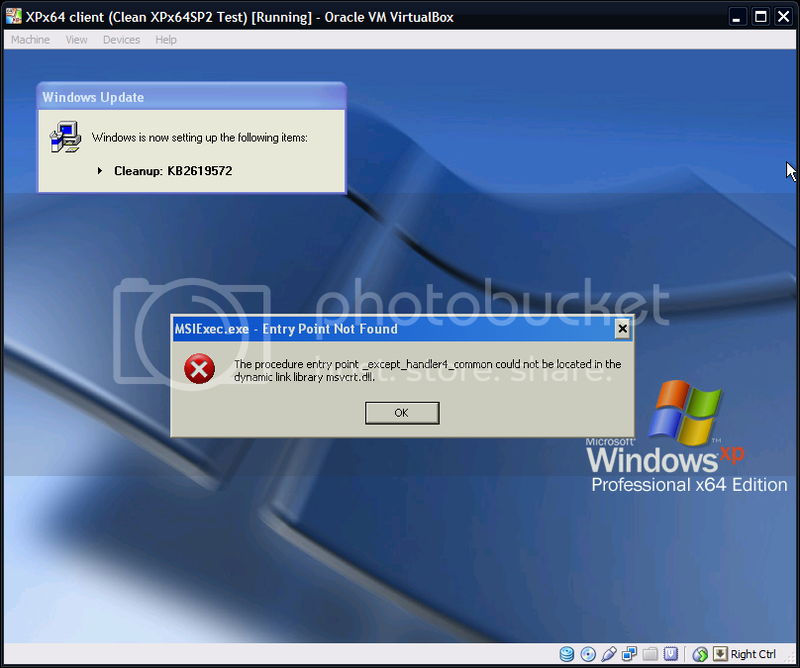 shiner wrote: After seeing tomasz' and Acheron's posts, I took some time to re-test the update with msftedit.dll v.5.41.21.2513 on clean XP VMs using user_hiddens Nov. update pack. I have been using KB2756651 msftedit.dll v.5.41.21.2513 since Oct 2012 without any problems whatsoever on my main XP SP3 machine. I think it's time to return a link it to the first post. A long time ago the great Geoff Chappell found out the never officially fixed Missing Icons in Notification Area bug and described a fix for it. MDGx still provides an implementation of Geoff's patch for SHELL32.DLL v. 6.0.2900.6018 (from KB2286198), which is nowadays quite outdated. Although I've not created an installer for it, I've decided to port Geoff's patch to SHELL32.DLL v. 6.0.2900.6242 (from KB2691442 aka MS12-048, July 10, 2012), which is the extant latest version of SHELL32.DLL (just the QFE branch, as, nowadays, even MS does not release GDR branch updates for XP SP3 anymore). Well, since March 10, 2015 my previous post above became outdated with the release of KB3039066 (part of MS15-020), which installs shell32.dll v. 6.0.2900.6752 (that's the POSReady 2009 version, of course!)... So I've decided to port Geoff Chappell's Missing Icons in Notification Area Patch to this new shell32.dll version... and here is it! And the file description on the properties tab will now say "Windows Shell Patched", for easier recognition. Note: If you don't have any reliable way of calculating CRC32, MD5 and SHA-1, here are official MS command-line utilities for doing that: CRC305 and FCIV (and no, you don't need to install KB841290 for that, just open it with 7z and grab inside it FCIV.EXE, which requires no installation at all). It works great for me, but YMMV and I can guarantee nothing whatsoever about this patch, and about the use one makes of it. So, by deciding to apply it you fully accept that anything you do is of YOUR SOLE RESPONSIBILITY... Hence, if after performing this mod your pc morphs into a purple mushroom and explodes, causing a 10-day worldwide blackout in the process, you know you can't blame me for it! You have been warned. Blackwingcat fixed an issue in Sound recorder. I was wondering if someone could help me overclock my USB ports so that my mouse can operate at 500hz. 2. Take a backup of the file, save it like usbport.BAK for instance. 5. Replace that string with this one: "B0 04 73 09 52 8A 0A 01"
8. Reboot, and it should all work fine. blindness for such things; you will notice that sensitivity feels LOWER. Other things: Better responsetime/less jitter/mouselag/whine from you. correct ones will then be: "B0 04 73 09 52 8A 02 01" for 250hz, and "B0 02 73 09 52 8C 02 01" for 500hz. in my usbport.sys file. Maybe it's because I'm using XP x64. Could anyone tell me what I'd replace it with to get 250hz, 500hz, 1000hz? But no one answered it. (It's a 404, but use archive.org to dig it up, it's there). The benefit of using the filter driver is that _only_ the mouse gets overclocked and not all the USB ports. But it only worked up to 250Hz so far with me Microsoft Basic Optical. I'll try with an old Intellimouse and see if that goes higher. Yes, with an old Microsoft "Wheel Mouse Optical USB" it does indeed work to 500hz, as measured by the "mouserate" utility. So I'd highly recommend this filter driver as opposed to hacking USBPORT.SYS. Again, since Oct 13, 2015 my previous post above became outdated with the release of KB3080446 (part of MS15-109), which installs shell32.dll v. 6.0.2900.6880 (that's the POSReady 2009 version, of course!)... So I've decided to port, once again, Geoff Chappell's Missing Icons in Notification Area Patch to this new shell32.dll version... and here is it! For instructions on how to apply this patch, please do refer to my previous post. I also have used Geoff Chappells patch without issues. I have changed the timeout to 10 minutes without problems. @Acheron: My implementation of Geoff Chappell's patch uses just 2 minutes for the timeout. I never found a machine needing more than that, but I guess it also depends on number of cores, processor speed and amount of RAM available, so that YMMV. Glat to know it works OK for you, too. And with a 5x longer timeout, on top of it! You rock! 5eraph wrote: I have v7.0.3790.4400 of msvcrt.dll and msvcirt.dll from KB955536-v2. BuildDate is "Fri Oct 31 08:04:47 2008". Impossible!!! v.7.0.3790.4400 of those files don't exist for x86, because no KB955536-v2 was ever issued for x86! V.7.0.3790.4341, OTOH, does exist, because there is a v1 issued for x86 of KB955536... now, all those files accomplish is to prevent XP SP3 from ever reaching desktop: it just freezes instead. Here is my list of the unofficial updates with their functions. Please correct me if I have supplied incorrect information. This update improves the reliability of x64-based versions of Windows that uses certain Intel processors. This update fixes an issue in which the operating system might function incorrectly. Again, since Sep 11, 2018 my previous post above became outdated with the release of KB4457163 (for POSReady 2009, of course! ), which installs shell32.dll v. 6.0.2900.7551... So I've decided to port, once again, Geoff Chappell's Missing Icons in Notification Area Patch to this new shell32.dll version... and here is it! For instructions on how to apply this patch, please do refer to my previous post. Tbanks, dencorso. Added a link to the aforementioned post in your previous post. I have a simple question to ask,what updates SHOULD i install of the list?I mean i use the POSReady trick to get updates as most of the people know and i want to know what updates can i install with having the posready trick and with all the latest updates?